Sad news, guys. Some weirdo stole my frickin’ lunch box out of the communal fridge at the law school. Which, it’s not weird to want to possess a really cool tiny little lunch box, I guess. But they left the containers that were inside of the lunch box – meaning they specifically opened the lunch box, removed the containers, and then took the box but not the containers. Thus, a weirdo. Anyway, because I still have the inner containers, bento box lunch Wednesdays live on. Except minus the box. The containers travel in a plastic bag now until I have emotionally recovered enough to order another lunch box. This box is made up of leftovers from homemade General Tso’s tofu, some rice, a small and simple salad, and some shelled edamame with soy sauce. I suggest you remove the tofu dish to the rice container and then microwave those together, leaving the edamame and salad nice and cool for munching. Bring 1 cup of water to a rolling boil. Add a splash of preferred oil (I use olive oil). Add 1/2 cup of jasmine rice. Allow water to return to a boil and then reduce heat to medium-low to maintain a simmer. Cover and simmer for 20 minutes until rice is soft. In any case, I thought it would be a fun and interesting feature to try and do a post on every other week (or so). Since playing around with the concept last week, I purchased a 700 mL microwavable liquid tight bento lunch box with an insulated carrying case and chopsticks. Even though I knew what to expect, I was initially surprised at how small the thing was – and this is despite the fact that for my age, height, and weight, I really should only need a 600 mL bento. Still, it was easy to see as soon as I packed my first meal that it would be enough for me for lunch. I committed to making myself a bento lunch at least once a week, preferably all three days I pack a lunch. Not only will this project keep me motivated to pack lunches for the remainder of the school year and once I am working full time over the summer, but it will help me find interesting ways to use up leftovers and (hopefully) discover new and interesting ways to combine food. 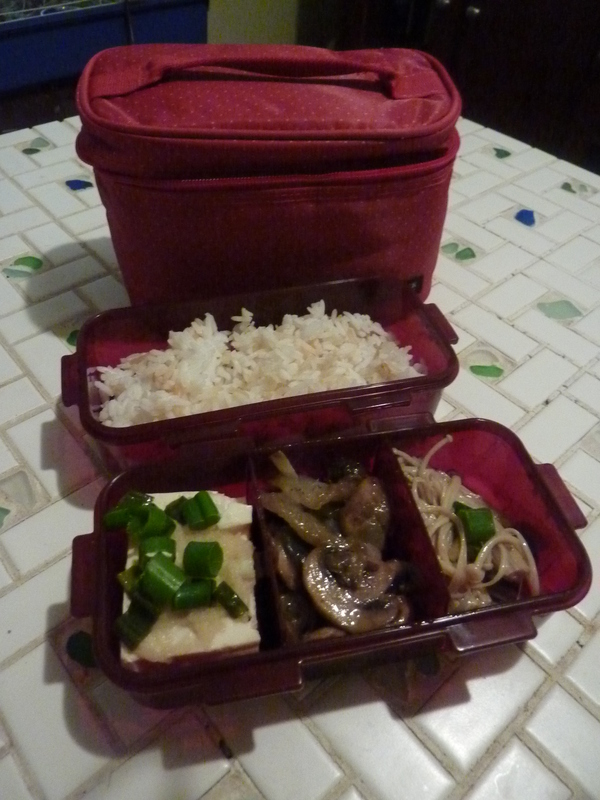 Usually, my bentos will be made up of leftovers from meals I have previously posted. 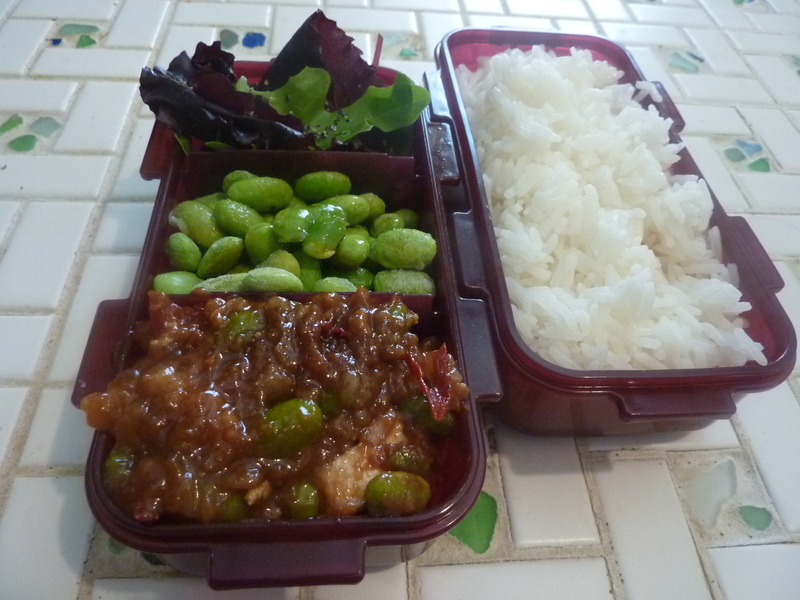 I won’t be making my bentos particularly pretty or cutesy, because, well, I’m lazy. And while I love a nicely plated meal as well as the next girl, when it comes to lunches, I’m not particularly fussy. The food won’t be strictly Asian-themed, and I’m sure I’ll stray from the recipe of three servings carbs, two servings veggie or fruit, and one serving protein from time to time. Generally, I will provide a “recipe” in the form of a list of components, with links to previous posts or brief instructions where the components were not derived from a leftover of a recipe I posted. Bring 1 cup of water to a rolling boil. Add a splash of preferred oil (I use olive oil). Add 1/2 cup of jasmine rice. Allow water to return to a boil and then reduce heat to medium-low to maintain a simmer. Cover and simmer for 20 minutes until rice is soft. Add desired amount of soy sauce. Add 1/2 tbs. of butter and 1 tbs. olive oil to a large sauté pan. Melt butter over medium heat. Add mushrooms and onions. Season with a bit of kosher salt and freshly cracked black pepper. Sauté, stirring frequently, until vegetables are desired consistency. I’ve been reading a lot of Haruki Murakami, lately. I love world he creates – simultaneously realistic and fantastical. Reading one of his books is like living inside of an uncomfortably vivid dream. One of the things I have enjoyed greatly over the course of all of his works that I’ve read has been the attention paid to food. So often in literature, authors neglect to portray their characters eating, which strikes me as absurdly unrealistic. As an author, Murakami casually captures the idea that food nourishes and sustains, sometimes through an important, monumental meal, and sometimes just as something to eat, quickly made and quickly forgotten. As his novels take place in Japan, I thought I would take a bit of inspiration out of his works and make a bento box inspired dinner. I have been researching bento boxes for awhile now, and finally pulled the trigger on buying one thanks to this meal, which consists of a variety of small Asian-inspired dishes. 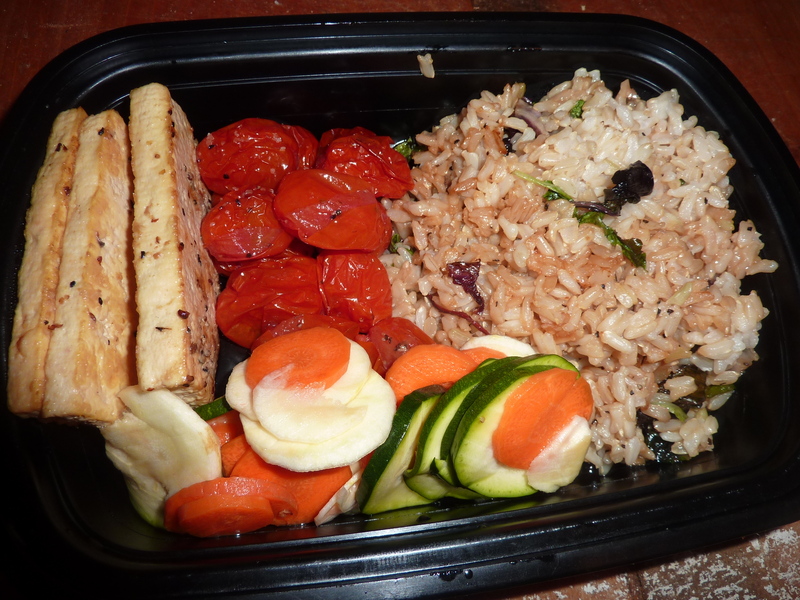 Bento boxes generally contain three parts carbohydrate (such as rice, pasta, or barley), two parts fruit and vegetables, and one part protein (such as meat, fish, or tofu). Bento boxes are particularly good for portion control, because if you follow the formula of 3-2-1, each milliliter of space, packed tightly, yields one calorie (for example, a 500 milliliter container is 500 calories). This dish is made up of some brown rice tossed with wilted greens, pickled vegetables, roasted plum tomatoes, and horseradish dry-fried tofu. I stuck to the 3-2-1 serving suggestion and was super happy with it. I tried to choose components that balanced out texture (meaty tofu, crispy pickles, soft tomatoes, toothsome brown rice) and flavor (tangy tofu, slightly sweet and slightly vinegar-y vegetables, sweet roasted tomatoes, and savory brown rice), as well as employed a variety of cooking techniques (sautéed tofu, pickled vegetables, roasted tomatoes, simmer riced). The flavors were simple but fresh, and we both really enjoyed this healthy, delicious dish. For dinner, I served these separated on a large plate, with everything except the pickles warm. For lunch, I ate this room temperature (pictured). Both were equally yummy. Cut tofu block into slices 1/2″ thick. Place a few paper towels or a clean kitchen towel on a cutting board. Lay tofu on top on a single layer. Top with a few more paper towels or another clean kitchen top on top. Top with another cutting board and weigh down with a heavy cast iron skillet or canned goods. Press until as much moister as possible is drained, at least an hour. Meanwhile, whisk together all remaining ingredients. Set aside. Heat a cast iron pan, stainless steel pan, or other pan NOT coated with non-stick surface. Heat over medium heat. Add tofu, working in batches if necessary so the pieces are not overcrowded, and cook about 4-6 minutes per side until golden brown and leeched of moisture. Transfer tofu and marinade into a zip lock bag or other marinating vessel. Place in refrigerator and marinate at least 3-4 hours but preferably over night, turning as necessary. Heat a pan over medium heat. Add tofu and marinade and cook until tofu is heated through and marinade is reduced, about 4-6 minutes per side. Serve immediately. Whisk together chile flakes, rice wine vinegar, water, sugar, and soy sauce. Add vegetables and place in a sealed container. Refrigerate at least one hour but up to overnight, depending on desired strength of pickle. Serve chilled. Heat olive oil over medium heat in a large sauté pan. Add garlic and cook until fragrant, about 1 minute. Add greens and soy sauce, tossing frequently. Cook about 1 minute until wilted. Add rice and toss to combine. Add lemon juice and toss to combine. Taste for seasonings and adjust as necessary. Cover a baking sheet with tinfoil. Toss tomatoes with olive oil and season liberally with kosher salt and freshly cracked black pepper. Place in oven. Roast about 25 minutes until wrinkled and dark brown in places, shaking 3-4 times during the roasting process.